The Thomas C. Denson family came to Texas in 1825 and was one of the first to settle in these parts. Thomas was born February 22, 1793 in North Carolina. In 1815, he and Shadrack Denson, who may have been his father, were living in Anson County, near Jones’ Creek on the southwest side of Pee Dee River. Thomas’ wife’s name was Polly and while in North Carolina, they had three children: O’Connor was born in 1813, John, 1815; and Elizabeth, in 1817. One child, Joseph, was born November 12 1823 inWashington County, Alabama and Shadrack was born in Texas in 1825. It appears that there was a second daughter, Nancy, but there is no additional information about her. It also appears that the Densons moved to Illinois before settling in Texas in Hayden Edwards Colony. Thomas C. Denson held a land grant in Wise County in 1830 and served the Republic as a citizen and a patriot. The family joined the Predestinate Baptist Church on September 5, 1835. On May 16, 1837, Thomas C. Denson’s name was on a petition for Houston County to be formed. He was issued a Head Right Certificate for one league and one labor of land on February 18, 1854. Thomas C. Denson and many of his decedents were farmers. The Thomas C. Denson family owned the Myrtle Lakeproperty east of Grapeland. There the children grew to adulthood and married as follows: 1. O’Connor married Mary Ann Swaggard (born 1816 Baden-Baden, Germany). They had nine children, including two sets of twins (John C., Jacob, Matilda, Malinda, Sarah, E.C., Adeline, Caroline and Mary). 2. John married Mary Ann Crawford (Houston). She had one child by a prior marriage and seven Denson children, including twin girls (Mary, Martha, Elizabeth, Rachel, Thomas, Nancy J. and Sarah). 3. Elizabeth married Washburn and had three children. The husband and three children died within a short time of each other. 4. Joseph married Caroline L. Houston (step-daughter of his brother John). Caroline L. Crawford was born November 11, 1836 in Tennessee. Joseph and Caroline had eleven children (Sally, Daniel T., Silas R., Emmaline, Martha Ann, George W., Elizabeth M., Julia, Ben, Joe, and Jottie). The 1st three died very young. 5. Shadrack married Mary Jane Salmon. They had four children. Mary Ann Crawford was born in North Carolina about 1817. Her parents were Mary Ann (Polly) Coble, born about 1793-1799, and Joseph Crawford, born in 1790. Records indicate Poly Coble and Joseph Crawford moved from North Caroina to Tennessee, where their daughter married Wilson Houston, who was lost some time in 1836 in Texas, while Mary Ann Crawford Houston was still in Tennessee. Mary Ann Crawford Houston came to Texas abut 1839 to join her husband, who supposedly perished in the Indian Wars, and subsequently married John Denson and her daughter, Caroline Houston, married Joseph Denson. Located about one-quarter mile from the DensonCemetery, Joseph and Caroline Denson’s home was constructed of hand dressed lumber and made with square nails. The house was still standing in 1970 and the well was dug by Joseph Denson. Lucille McCutcheon of Houston described visiting her Grandmother Caroline when she was about 6 or 7: “Grandmother smoked a corn cob pipe and made Irish lace with some kind of wooden needle. I have an old three legged iron pot which belonged to her and the family story is that ‘Sam Houston has eaten many a meal cooked in that pot’. I do not know how she was related to Sam Houston, but he visited her on many occasions and she called him ‘Sam’. She married when she was only 13 or 14 years of age.” John (he was believed killed in the Civil War) and Mary Ann Denson’s eldest daughter, Mary (Polly) married Elbert Brimberry, and their daughter, Nancy Jane married Elbert’s brother, George A. Brimberry. George A. and Nancy J. Brimberry were the great-grandparents of Jerry L. Brimberry, who has compiled an extensive history of the Brimberry family. Jerry was born in Crockett, July 25, 1940 and is the son of Eldridge Lee Brimberry and Dorothy Lee Augusta Moore. He has three children (Lisa Kay, Darrell Lee and Kari Lynn) by his first wife, Lanna L. Mathewson, and has been employed by the U.S. Public Health Service since 1964. Jerry lives in Atlanta, Georgia with his second wife, Suzanne Irene Nash, who is a native of Toronto, Canada. John and Mary Ann Denson’s second daughter, Elizabeth, married John Turner Skidmore. 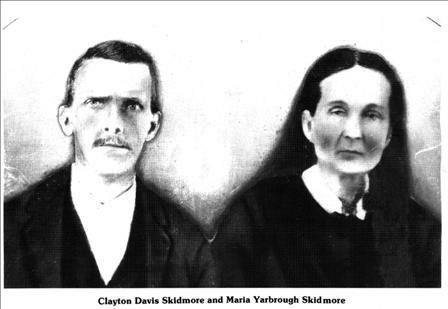 John T. Skidmore was the son of Mariah Yarborough and Clayton Daniel Skidmore. John Turner Skidmore and Elizabeth Denson Skidmore had ten children. Their second child, John Clayton Skidmore, born September, 1869, was the father of the late Arwine Skidmore, who was a fifth generation citizen of Houston County. In checking his lineage, Arwine found that he was kin to himself. His maternal grandmother was the daughter O’Connor Denson, brother of his great grandfather, John. His maternal grandmother was Sarah A. Denson who married John Chapman. Arwine’s mother was born in April, 1875. The Skidmore family lived south of Grapeland near ‘convict springs’. John Turner Skidmore had an early day gin and grist mill which was powered by water. It was on the railroad and the trains stopped there for water when the tracks were finished in 1872. Arwine Skidmore was born in 1898 and married Cora Estell. They had three children: Gwendolyn, who married Arthur Walton, Jr.; Ouita, who married Henry H. Dailey, Jr. (deceased) and O.B. O’Dell; and John who married Jean Mason of Stephenville. The late Arwine Skidmore’s great grandchildren are eighth generation Houston Countians. Other descendants of Thomas C. Denson have intermarried with familiar names of the Grapeland area such as: Frazier Owens, Carter, Whitaker, Tyet, Clewis and Shaver.